Often referenced as ‘the greatest golf architect of the 20th century’, Harry Colt has designed some of the world’s most well known courses, and we’re very proud to say that Ham Manor is one of them. Born in 1869 in Highgate, London, Harry Colt fell in love with golf on Malvern Common, and became a well known golfer when he attended Cambridge University. He was inspired to seek a career as a golf course architect when he helped design Rye Golf Course at the tender age of 25, and through his involvement in redesigning holes at Sunningdale Golf Course. 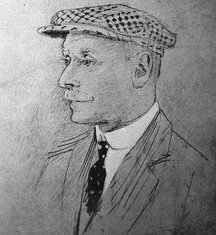 Harry Colt, along with his long-time colleagues Charles Alison, John Morrison, Dr Alister MacKenzie, and James Braid designed around a staggering 300 golf courses during his lifetime, making sure his team were always methodical and consistent in their approach to the layout every time. The trademarks of these architects, most notably Harry, are early holes to ease players into the round, a layout determined by the land as opposed to the other way round, and courses that prompts the use of every club in the bag. It would be entirely fair to say that courses designed by Harry and his associates are nothing short of design masterpieces. Ham Manor epitomises Harry Colt’s genius, and we are dedicated to honouring his original concepts during the upkeep and improvement of the beautiful course.